Other: Marked is the first book in the House of Night Series. There's expected to be 12 books in the entire series. The eighth installment, Awakened, was published on January 4th - the ninth book, Destined, will be published in November 2011. The House of Night series is set in a world very much like our own, except in 16-year-old Zoey Redbird's world, vampyres have always existed. In this first book in the series, Zoey enters the House of Night, a school where, after having undergone the Change, she will train to become an adult vampire--that is, if she makes it through the Change. Not all of those who are chosen do. It’s tough to begin a new life, away from her parents and friends, and on top of that, Zoey finds she is no average fledgling. She has been Marked as special by the vampyre Goddess, Nyx. But she is not the only fledgling at the House of Night with special powers. When she discovers that the leader of the Dark Daughters, the school's most elite club, is misusing her Goddess-given gifts, Zoey must look deep within herself for the courage to embrace her destiny--with a little help from her new vampyre friends. 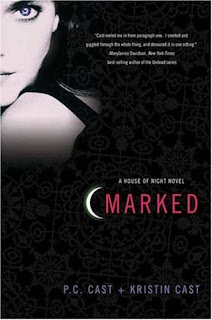 Marked is the first book in the House of Night series that will eventually hold twelve books. Zoey is Marked when she's at school one day, after the Tracker Marked her. She has to get to the House of Night before it kills her. She enters the House of Night and she immediately stands out with her filled in Mark. I've heard from this series a couple of months ago and finally managed to pick up a boxed set for $ 18 during a sale. I thought that the story wouldn't contribute much to all the vampire books out there, but I was pleasantly surprised and really enjoyed myself while reading it. What I like about the vampyres in this book is that they found a way to get rid of almost all the clichés that are out there about vampires. The House of Night reminded me of Hogwarts, but for vampires. I really enjoyed myself while reading it, even though the writing wasn't that great at some points. It was easy to read and easy to relate to Zoey. Even though the book is written from her point of view, you can still find out things for her, before she even thinks about it. Because I really liked it! I'm glad I have the three books that follow this book, so I can pick it up any time I want - and I think it's going to be real soon.